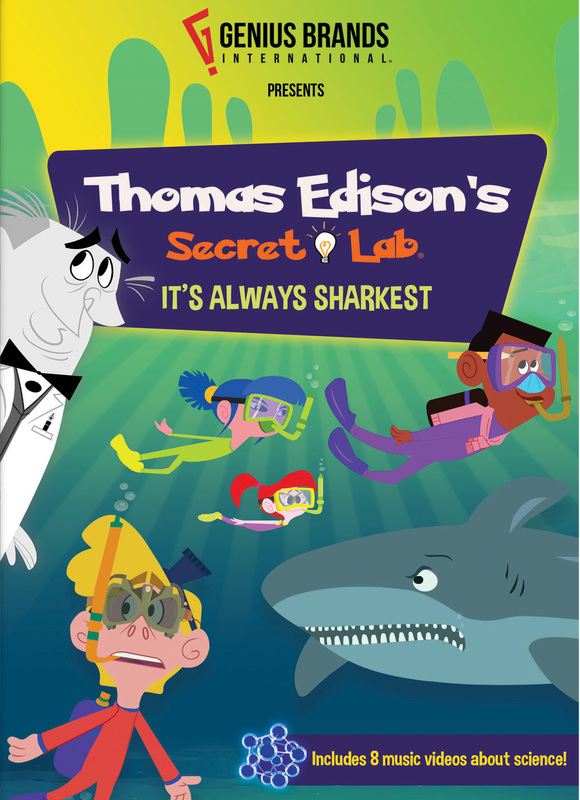 Thomas Edison’s Secret Lab: It’s Always Sharkest – Stealth Learning at its Best! You are here: Home / Media Reviews / Thomas Edison’s Secret Lab: It’s Always Sharkest – Stealth Learning at its Best! Unknown to the world, Thomas Edison built a secret lab where he invented a virtual version of himself and a steampunk robot named Von Bolt. Years later, Angie, a twelve-year-old science prodigy, discovers the lab. While visiting one of Kent’s relatives, the kids come up with a great idea for attracting more tourists to his restaurant – the only catch is that it also attracts a very big shark with very big teeth! What will the Secret Lab Kids do? Guided by fun-loving Edison, Angie and friends will show just how fun science can be. KIDS FIRST! Film Critic Jolleen M. comments, “I love all of the puns and the jokes. I thought that they were very funny. I also thought that it was awesome that everything tied in with learning, so that you could enjoy watching the movie while learning new things about science.” Carla P. adds, “The show has cool features that I’ve rarely seen on a TV show. At the end of every episode, they have a music video recapping what they learned in that episode.” KIDS FIRST! Adult Juror, Rachael V. wraps it up with, “This collection is called ” It’s Always Sharkest” because it features an episode regarding a shark ‘ s sense of smell. Thinking about subjects such as DNA and radioactive decay doesn’t seem to be very appealing to younger kids, but these episodes change that. It gives a very hands on, kid friendly approach to not just learning about these subjects, but enjoying the adventure along the way.” See their full reviews below. The animation reminds me somewhat of the TV show The Fairly Odd Parents. Both have similar animation styles. They both look sort of like paper cutouts. Furthermore, I like how the robot’s actions are animated. In the first episode, one of the robots is almost eaten by a shark so he spins out of control to try to get away from the shark’s mouth. I thought that was hilarious, seeing him spin out of control. I’ve been lucky enough to review two of the Thomas Edison’s Secret Lab DVDs and I just love them. As a kid I always loved science class, but I know that not everyone did. There were lessons that appealed to me less than others and I was lucky enough to have shows such as Bill Nye the Science Guy and The Magic School Bus to inspire me . This collection is called ” It’s Always Sharkest” because it features an episode regarding a shark ‘ s sense of smell. Thinking about subjects such as DNA and radioactive decay doesn’t seem to be very appealing to younger kids, but these episodes change that. It gives a very hands on, kid friendly approach to not just learning about these subjects, but enjoying the adventure along the way. One of my favorite things about this program is meeting the creators take on other scientists like Darwin and Watson. The animation is phenomenal and the lessons learned are even better. I recommend this to kids ages 5 to 12, but make no mistake, I greatly enjoyed learning new things and relearning things I had long forgotten. If I could rate this higher than 5 stars I would, but since I can’t , I give it 5 out of 5 stars!